Davie Furey is no stranger to performing on a festival stage. 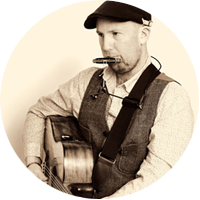 Since the release of his newest offering ‘Secret Light’, which reached #1 in the Singer/songwriter charts, Davie has been gigging consistently at festivals, in radio studios and in venues all over the country. Secret Light is something of a departure from his previous fusion of traditional folk and contemporary rock. It’s the first single from Davie’s forthcoming album and with it he maintains the essence of the energy and pulsing guitar riffs of previous records while infusing a heart-felt intensity and sincerity deep within the song. It is clear from listening to this track that Davie has drawn on a diverse cross-section of influences while crafting this transcendent sound that clearly deals with a medley of profound emotions. Davie's last release, an eleven track album entitled 'Easy Come Easy Go' was very well received in live venues across the country when he took it on tour, this high energy folk/rock/roots inspired show took to the road finishing the tour with a show in a packed Whelan’s in late 2016. Since its release the album has already been showcased by RTE, BBC Radio and a number of other stations both home and abroad and resulting in a worldwide publishing deal with Universal Music. Davie has already been nominated as best singer/songwriter by the Acoustic Yard Radio Show for 2016 and Best Newcomer 2016 by Pure M Magazine and nominated again for Best Male Artist 2017. Davie’s knack for telling a story through song and his ability to engage a crowd have won him support slots with the likes of Damien Dempsey, Josh Ritter, John Spillane and Luka Bloom. Davie’s live performances illuminate his sincere vocal and talent for impassioned story-telling, a wonderful artist to watch live.